Some of you may know I am a member of the Great Lakes Association of Astronomy Clubs (GLAAC) planning committee. If you didn’t already know that, well, now you do. Being an association of astronomy clubs means that we have a lot of exchanges between clubs, and we like to advertise and sometimes even help out with each others’ events. If you are interested in Astronomy and happen to be in SE Michigan (or even into mid-michigan) you should check out the website, glaac.org. You can find a club to join or events to attend. Venus really shines this month (sorry, couldn’t resist.) It is bright enough to spot in broad daylight if you happen to have a paper towel tube and know exactly where to look (but do be careful, it’s not that far from the Sun.) The best views of course are in the evening, just after sunset. It’s particularly nice this month in a low power telescope, since you’ll be able to watch it change noticeably in shape and size. At the beginning of the month look for it at mid altitude (~35º) and due west. It sets in the NW just after midnight. Late in the month it will be low in the WNW at sunset, and sets around 10 PM. Look for Venus and a very young Moon on May 22. Mars continues to be a good evening target. Though it is pulling away from us and therefore getting smaller, it is now high in the sky during the evening, so it is an easier target for evening observers. Look for it high in the south not far from the blue star Regulus in Leo all month. The first quarter Moon passes just below it on May 28 – 29. On May 31, Mercury re-appears in the evening skies, but just barely. The best views of this elusive planet will come in the last 2 weeks of June and first 2 weeks of July, when the sky tends to stay bright well past the time when Mercury sets. Use binoculars, and try especially on June 21 and 22, when the very young Moon can help guide you. On May 20, there will be an annular eclipse of the Sun. You basically have to be in the Pacific to really see this, but there will be webcasts. Check out the resources at http://eclipse.gsfc.nasa.gov/OH/OH2012.html#SE2012May20A or join the Exploratorium in Second Life http://blogs.exploratorium.edu/fabricated-realities/2012/03/03/annular-solar-eclipse-of-2012-may-20-in-sl/. 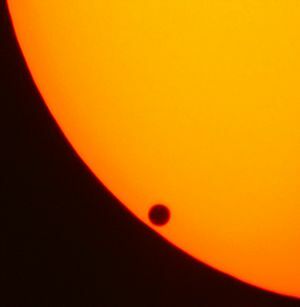 Local transit times | Venustransit. Trying to figure out if the Venus transit will be visible where you are and when it’ll happen? This website is handy. It’ll show you a map so you can make sure the location you enter is correct, then it’ll tell you a probability that it’ll be cloudy, and the important times (first contact, transit center, etc.) A slider on the bottom lets you adjust the central dial so you can see things like what time sunset will cut off the view.